How to find the true magic of Disney World with the No.1 best-selling guide to Orlando. We'll help you plan your perfect trip to Orlando, whether it's your first time there or you're a seasoned visitor. 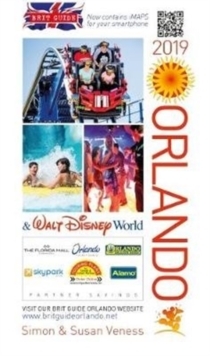 Your Brit Guide to Orlando 2019 includes: * Brit Tips - our legendary personal, insider tips to ensure you make the most of your magical adventure* Internet links to help you find the best times to go, the cost-effective ways to get there and the outstanding hotels in your budget. Click it, to book it... sort of thing. * Detailed listings on the best restaurants, bars and shops, with Brit Guide Discounts* Full-colour photographs throughout You'll get the insider advice on how to use FastPass, where to stand to see the fireworks or the ideal location for watching the parades. Brit Guide Orlando 2019 has every trick you need to make yourself a dream holiday that will be remembered by everyone for a lifetime.